If you’re a cloth-diapering superstar and you’re champing at the bit to do Ma Earth one better, Bottoms Up’s chemical-free reusable diaper wipes are just what the planet ordered. 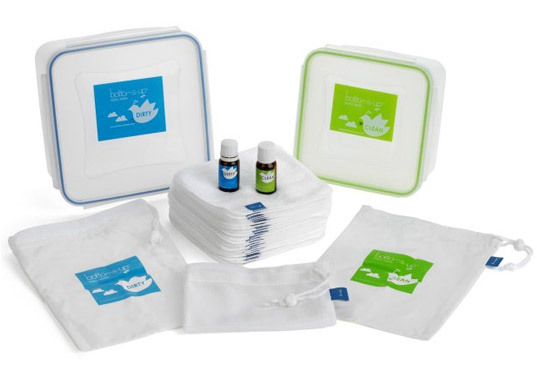 The All-in-One Kit makes it easy, with 25 all-natural cotton wipes, two essential-oil blends formulated for “clean” and “dirty” tushies, and two wipes containers. Planning on hitting the road? The pair of waterproof travel bags will stand you in good stead—and keep you covered—until the next available washing machine. If you're a cloth-diapering superstar and you're champing at the bit to do Ma Earth one better, Bottoms Up's chemical-free reusable diaper wipes are just what the planet ordered. The All-in-One Kit makes it easy, with 25 all-natural cotton wipes, two essential-oil blends formulated for "clean" and "dirty" tushies, and two wipes containers. Planning on hitting the road? The pair of waterproof travel bags will stand you in good stead�and keep you covered�until the next available washing machine.